"Yeah, I've been beaten up. But I'm not beaten." I think we all did our fair share of torturing teachers in our day�no doubt my fondest memory of middle school was when, in order to get out of a French test, we successfully goaded bad boy Don into setting off an M-80 in a boys' room toilet. (The cloud of porcelain dust alone made this indelible, and it wasn't me who got sent to the principal's office.) It's easy for nostalgia to creep in, especially when you compare the complaints of those who work at inner city public schools (gang violence, armed students, illiteracy, teenage pregnancy) with those that were expressed half a century ago: chewing gum in class and tardiness, for instance. Some of Blackboard Jungle remains hard hitting, though much of it seems dated and quaint; a handful of actors, a solid soundtrack and some energetic filmmaking from director Richard Brooks make this one worth cutting class for. The opening credits peg the historical moment�as the title cards go by, Bill Halley and His Comets can be heard rockin' around the clock, establishing a tone of generic '50s modesty, not of danger. Our hero, Richard Dadier, interviews for a job as an English teacher at North Manual High School; the students are unruly and the faculty apathetic, yet the position is considered a plum one, and Dadier takes his gee-whiz earnestness into the classroom. He's got a principal deeply in denial about the discipline problem at the school, and a new roomful of students looking to give the new guy the business�it's Dadier's relationship with his students that are the crux of the drama. Initially, the students don't really seem that tough, especially by gangbanging standards�you half expect them to break out into a chorus of Gee, Officer Krupke. But actions speak louder than words, and soon Dadier finds himself in trouble: he gets beat up in an alley, routinely challenged to fights, and sees his peers and his wife psychologically terrorized by his students. There's a soapy sense to the proceedings�of course we know that Dadier will be the one, the loose cannon, to forge a connection with the boys; and of course Dadier's colleague with his Coke-bottle glasses and his precious collection of jazz records will see both destroyed by the students, along with the teacher's spirits. In many ways the storytelling borrows heavily from Westerns, and their emphasis on community�here, there's a new sheriff in town, and the drama comes from figuring out who can get along with the long arm of the law. Part of the problem is that there's not much incentive for the students, and hence not much leverage for Dadier�school has been a great joke to them all so far, and the fear of juvie isn't enough to get them into shape. Still, the cast especially make this fun to watch. 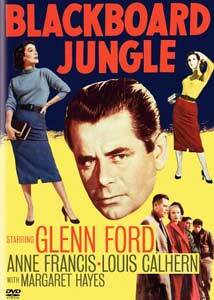 Glenn Ford plays Dadier, and his heartfelt commitment to teaching seems genuine and not cloying. The ringleader of the students is Miller, played with smoldering impudence by a young Sidney Poitier; a decade or so later, Poitier would be on the other side of this story, in To Sir With Love. Dadier's bete noire is West, played by the intensely nasty Vic Morrow, who is all menace, but only in Hollywood could someone with his five-o'clock shadow still pass as a high schooler. On the home front, Dadier's wife is pregnant, and rightly worried about her man; Anne Francis is very pretty in the part, but the script doesn't give her a whole lot to do, as almost all of the action happens in the classroom. While much of the movie is predictable, there are some aspects that remain keenly and sadly relevant�one of the students talks about how no one cares for them, for instance, but will be happy to use these inner-city boys as cannon fodder the next time the powers that be decide to fight a war. And while Dadier is the hopeful exception, the portrait of the faculty is an especially despairing one; they are just about uniformly hateful toward their students, for whom they have unveiled contempt. It's a tough job, being a teacher, but that sort of nasty malaise is probably still all too commonplace in our schools today. Image Transfer Review: The black-and-white photography has been reproduced nicely here; it's marred only by occasional scratches, in the second half of the film especially. Audio Transfer Review: There are some erratic dynamics on the mono track�the score of the film is memorable, but every now and again it subsumes the dialogue. Extras Review: You'll find all sorts of fond reminiscences on the commentary track, and each of the four participants have a significant amount to contribute: they are Toledo's own Jamie Farr, who, billed as Jameel Farah, has a small role as one of the students; Paul Mazursky, who has an even smaller role, and went on to a distinguished career as a director; Joel Freeman, an A.D. on the picture; and Peter Ford, the son of Glenn Ford. There's lots of talk about being on the lot at MGM, and the New York pedigree of the cast, with Farr as the sole exception; at one point Mickey Rooney was considered for the role of Dadier, and Steve McQueen for one of the thugs. There's a lot of catching up being done here, all colored by a wistful nostalgia for the days of the studio system. It's a fun listen. The only other notable extra is Blackboard Jumble (06m:25s), a cartoon featuring Droopy Dog in a parody of the feature. Don't be a square, daddy-o�some of this seems dated and silly, but it's a movie with a great jangly energy and some terrific actors, and the DVD sports a commentary that's well worth a listen.